Here is my version of the Creole classic Chaurice. I like to make a decent sized batch which I portion into vacuum sealed packages and freeze. Place all of your grinding equipment in the refrigerator 1 hour before grinding. Using the 1/2″ die for your meat grinder, grind all of the ingredients. Alternatively you could finely mince the ingredients in a food processor or by hand. Cook a small patty to taste for seasonings, reseason if necessary. Follow my instructions for Linking Homemade Sausage. I make my Chaurice into about 10 inch lengths. When finished, I vacuum seal the links into individual portions and freeze. They will keep indefinately in the freezer. I probably won’t ever make my own sausage, at least not as long as I have a full time job as well as trying to write a blog. But I wish I could rush over to your house and get some of these. I’ve always wanted to make homemade sausage but could you just send some my way? This looks so good! I gotta go eat something after looking at all the great pictures of your food! Kalyn, Joe – If you have the equipment, sausage making is not nearly as time consuming as you may think, give it a try some time! It is well worth the effort. Brad – They have some fairly inexpensive sausage stuffing, and grinding equipment, in fact, you can even use a disposable pastry bag to stuff small batches. Being a hunter, you may enjoy making some excellent venison sausages. But for sure, we will feast on some of my stash next time I see you! Anne – Sounds like it would be great time spent with Dad, especially the meal afterward. I know from being a regular reader of Anne’s Food that you would create something exciting and delicious with it! That ingredient is totally optional, especially in a fresh sausage as this, I used it because I was thinking of smoking a portion of this batch. The curing salt protects color and prolongs shelf life. Sorry for any confusion. This was nothing to throw together and is absolutely delicious. A big thanks from Alaska! I have a batch of your andouille in the smoker as we speak. Your website is a lifesaver. I always thought this stuff was too hard to do. I made this sausage last night. The recipe I used didn’t call for cumin or paprika, although I wish it did. Instead it called for fresh parsley along with al the other igrediants to your recipe. I didn’t smoke mine though. Is that necessarry for this sausage? Dean – it’s not necessary, Chaurice is a fresh sausage, although it does smoke up nicely. 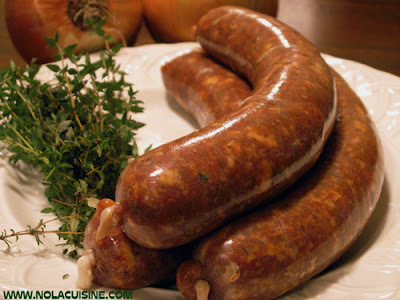 Just an FYI: “Chaurice” is actually a Portuguese sausage, similar to Portuguese linguica. Chaurice is common in the Portuguese communities in New England, but isn’t well known on the West Coast, as linguica is. Many Portuguese settled in the New Orleans area, as they are generally ‘coastal’ people and tend to live in areas where they won’t be far from the sea. Does anyone out there have a recipe for New Orleans po’boy bread? The bread I make does not measure up. Desperate in Alabama. I make my own sausage on occasion and this one sounds great. I love red beans and rice and have usually used diced ham, which is very good, but this sausage sounds delicious. Making your own sausage is easy and you just can’t get the quality of your own finished product anywhere else. If you haven’t tried making your own you should definitely give it a shot. You can make great breakfast sausage without equipment, though a grinder would come in handy because I’ve rarely had good luck with packaged ground pork.